Norway is a lowly populated country with beautiful landscapes. 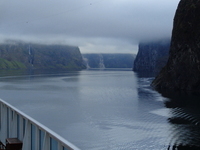 You get to see lots of Countryside, natural beauty and sail into the Fjords while there. Even the Air seems fresher! Cabin was good and well maintained. Shower was small but that was ok. Food options good . The Sit down dinner restaurant allows you to tinker your next days dinner menu to suit your tastes. We chose local port based tour operators , who are waiting as you disembark on ports and bought their tours, having pre checked options on google/on Board . 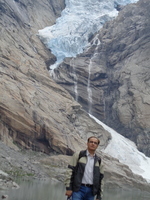 For instance we recommend a trek to Briksdal glacier. You need buy bus tickets as you get down from ship. Buses go there and then you do an hour or 90 minute walk up to base of glacier , come and board your bus back to port. . Ask anyone for local operator , at port disembark area. They actually wait for ship arrival and time their bus departures accordingly and arrivals to match. Tours bought on Board are typically 2-3 times priced. On board we could play TT at pool side and do our walks on top deck. So go for Norway!! We plan a Repeat! 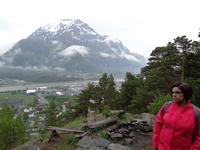 Norway is a lowly populated country with beautiful landscapes. 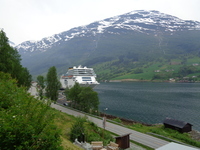 You get to see lots of Countryside, natural beauty and sail into the Fjords while there. Even the Air seems fresher! Cabin was good and well maintained. Shower was small but that was ok.
Food options good . The Sit down dinner restaurant allows you to tinker your next days dinner menu to suit your tastes. 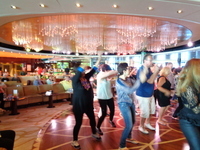 We chose local port based tour operators , who are waiting as you disembark on ports and bought their tours, having pre checked options on google/on Board . 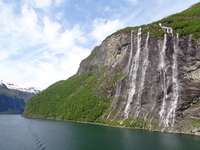 For instance we recommend a trek to Briksdal glacier. You need buy bus tickets as you get down from ship. Buses go there and then you do an hour or 90 minute walk up to base of glacier , come and board your bus back to port. . Ask anyone for local operator , at port disembark area. They actually wait for ship arrival and time their bus departures accordingly and arrivals to match. Tours bought on Board are typically 2-3 times priced. On board we could play TT at pool side and do our walks on top deck. So go for Norway!! We plan a Repeat! One can reach early , at checkin counter .Good time maybe by 11 am to avoid rush . And in our case we anyways had no other plan . One sad part was Costa retains Passport for some Country folks , for reasons best known to Costa !